Ahhh…September 29. Fall has most certainly arrived in Michigan, folks, and I couldn’t be happier about it. How do I love thee, dear Autumn? Let me count the ways….. The trees bursting into fiery reds, yellows, and oranges (for those of you who have not been to Michigan in the fall, and especially the Upper Peninsula of Michigan, you are really missing out–plan a trip!). I get to turn on my oven, and the longer the better…. I suddenly want to eat crisps, and how could that be a bad thing? Apple crisps, peach crisps, pear crisps…mmmmm…! I’m the kind of girl who really doesn’t like wearing shorts. Fall eliminates that concern with no loss of comfort. The “crisp” air that only comes in the fall. Everyone getting outside to enjoy the last of the good weather. Art Prize! The world’s largest juried art competition, and just down the hill in downtown Grand Rapids. The triumphant return of flannel. And a warm ‘welcome back’ to down vests, knee high boots, cable sweaters, mittens, and skinny jeans. The smell of wood smoke and harvest moons when we’re heading home from walks downtown. Apples, pears, squash, plums, kale, beets, soups and stews, ‘nuf said…! I could go on and on about why I love fall but I’ll cut to the chase and get to the tasty stuff. I truly believe that our bodies crave what is in season. How do I know this? In spring, all I want is asparagus, peas, radishes, and spring greens. In the summer it’s corn, corn, corn, and tomatoes, summer squashes, strawberries, blueberries, raspberries, and peaches. Now that the air is turning cooler and the sun sets at eight (when did that happen!? ), all I want is to turn the oven on and roast squash, turnips, beets, and carrots. I’ve already gone through two delicata squash and a large spaghetti squash by myself in the last three days. And…I want more. As we speak, spaghetti squash number two is in the oven, two more delicata squash have been seeded, sliced, and roasted, and two sheet pans of beets, turnips, and carrots are being roasted for meals this week. And what the heck, I think I’ll throw in some apples to roast in a bit. I’m going whole hog today, with no animals harmed in the process. Yesterday I walked downtown to look at more ArtPrize exhibits (in September and October our city transforms into a giant art exhibit, with about 1,500 artists displaying their work at venues all over downtown. Everywhere you turn there is something beautiful, exciting, unique, inspiring, heart-wrenching, joyful, colorful, or thought-provoking. And thousands of people come to view and engage with the art, turning our city alive in a way I have never seen it before. 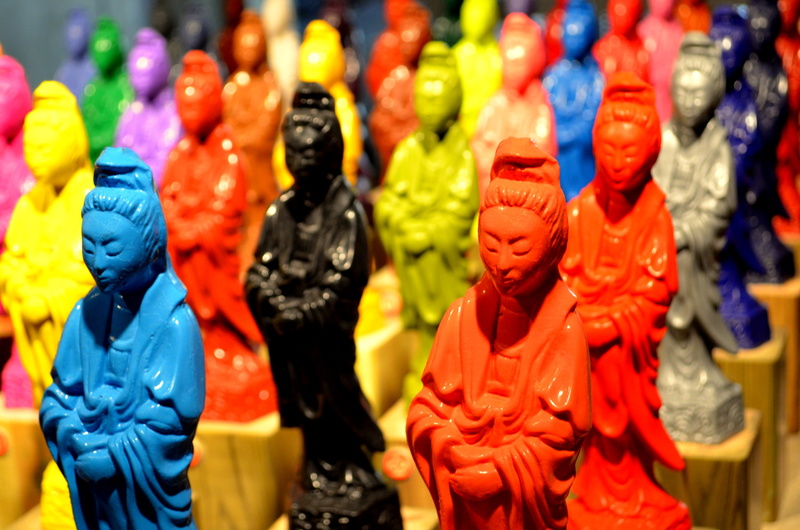 An Art Prize exhibit…these figurines were made by melting Crayola crayons into molds. 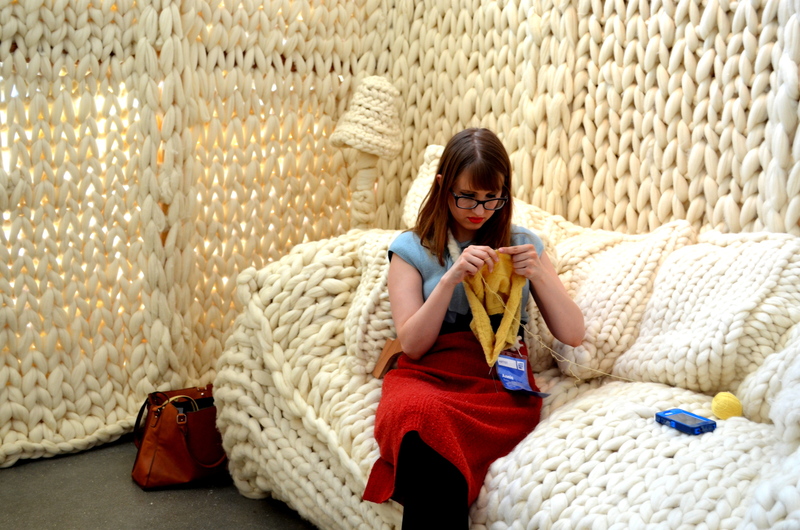 An artist knitting away in her Art Prize Yarn House exhibit…very original and cozy to boot. Art Prize has music now, too! 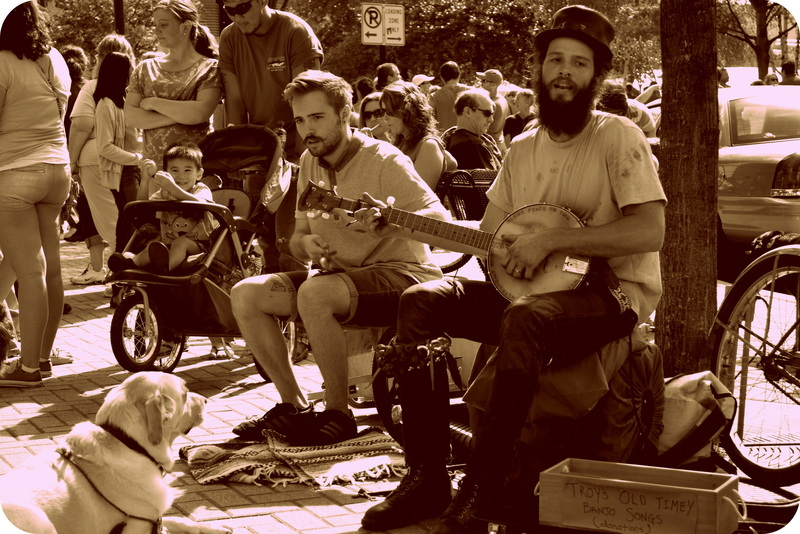 Some good old time banjo on a beautiful sunny and warm fall day. After I walked around for several hours yesterday until my poor little feet could take it no more, I headed home to the solitude of my kitchen to whip up a few autumn-inspired dishes. This salad was one of the results. 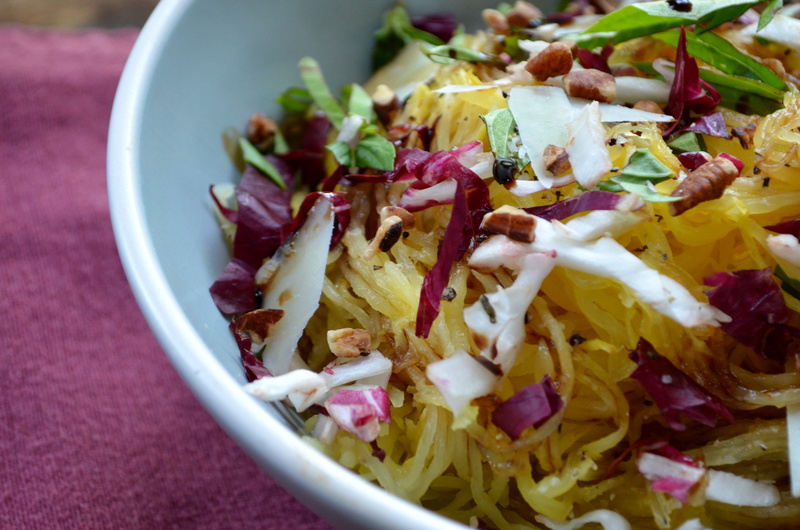 Simple, very healthy, low calorie, vibrant, and filling. It’s going to be a dish I turn to again and again each fall. What are your favorite things about fall in your neck of the woods? I’m curious what fall is like outside of Michigan…do tell! Prepare the squash. Carefully cut the squash in half lengthwise. I like to cut a bit off the bottom so it stand upright without wobbling before I cut it. Next, scoop the seeds out of the squash halves. Place the squash halves, cut side up, on a baking sheet and brush with the olive oil. Poke a each half a few times with a fork, concentrating on the ends. Cover with tin foil and bake until you can pierce the squash with a fork. Note that it won’t feel as soft as some squash does when baked. There will be a little resistance but you will be able to push the fork through. Let squash cool on the pan. Once squash is cool enough to tough, take a fork and drag it along the middle of the squash. The squash will start to come up in strings that look like spaghetti noodles. Continue to scrape the squash into a bowl until you are left with the outside skin of the squash. Discard the skin. 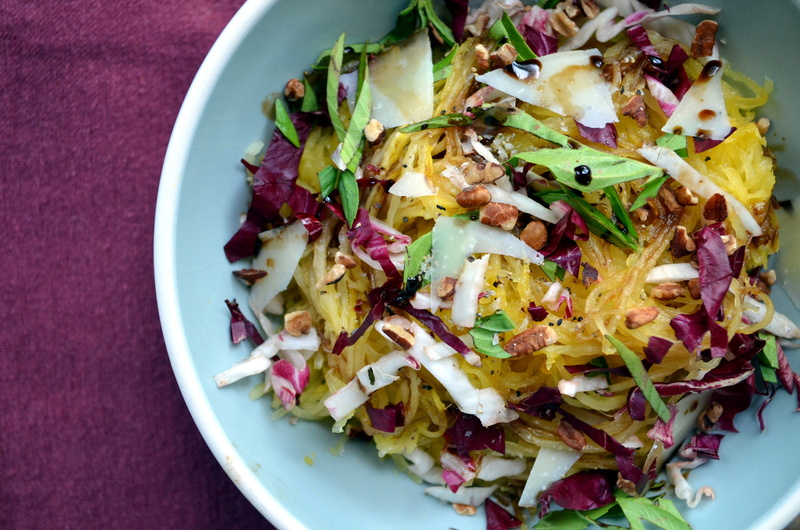 Toss the squash in the bowl with basil, radicchio, hazelnuts, olive oil, and balsamic honey glaze. Salt and pepper to taste. Dish into smaller bowls and sprinkle with shaved Romano or Parmesan before serving.